The National Library of Ireland is situated at Kildare Street. The library holds an estimated five million items ranging from books, manuscripts, prints, drawings, photographs, maps, newspapers, microfilms and ephemera. Founded in 1877, the library has since then been an important part in documenting Dublin's present and past; the building itself is a historical monument. The National Library of Ireland is a cultural institution under the aegis of the Department of Arts, Sport and Tourism. Its mission is to collect, preserve and make available books, manuscripts and illustrative material of Irish interest. The Dublin Library was founded in 1877, and since its foundation, has assumed a special role in relation to the documentation of Ireland's present and past. Housed on Kildare Street, the building in itself is a national treasure and splendid piece of architecture whose spacious Rotunda and domed Reading Room have been celebrated by many. Users of the Library have a wide variety of interests. They can include those engaged in long-term research with a view to a book or article and those with a specific once off need. 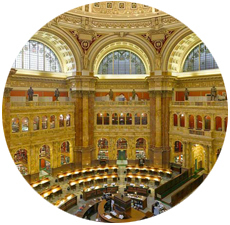 The National Library is open, free of charge, to all that want and need to use it. A Reader's Ticket is necessary in order to consult most categories of material. The Dublin Library does not lend books and reading is done in the various reading rooms. There is also a copying service and it is possible to get photocopies, photographs, slides, or microfilm of most items in the collections. The Library has an ongoing programme of exhibitions. 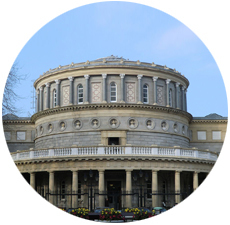 Donations of material are always most welcome; in addition, those wishing to make a financial contribution towards the work of the National Library by donation or bequest may do so through the National Library of Ireland Trust. There is also a support group, the National Library of Ireland Society, which is concerned with promoting and publicising the Library. 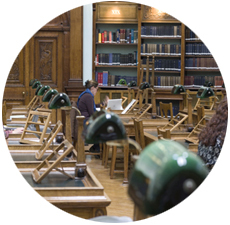 Membership is open to all those with an interest in the Library and the heritage in its care. Richly dressed 19th century children gaze out of studio portraits, while images of children making fishing nets in West Cork industrial schools, or learning lace-making in Donegal hang side by side with 20th century boys and girls praying, acting out war games or getting ready for a day at the beach. These are just some of the many photographs in the exhibition Small Lives where captivating views of Irish childhood between 1880 and 1970 juxtapose children’s lives with the broad sweep of Irish social and political history. Small Lives runs at the National Photographic Archive in Temple until June 2012. Celebrate Ireland's rich history and heritage with the free multimedia exhibition Discover Your National Library at 2/3 Kildare Street, which brings you some of our most precious treasures, and allows you to hear from the curators who take care of them. A new selection of treasures is now on display in Discover, including 700 year-old manuscripts, 19th century eviction photographs, a letter from war artist William Orpen, illustrations from some of Ireland's best illustrators of children's books, and a special display on our "throw-away treasures". This phase of the exhibition, which runs through 2011, includes a special focus on the history of the Irish Texts Society. Free public tour: Tuesdays at 2.30pm. Tall Tales & Deadly Drawings FREE December is your last chance to check out Tall Tales & Deadly Drawings, our colourful display in the NLI’s main hall featuring Irish children's books and amazing illustrations from our collection of drawings. Get involved when you visit - leave us a magic leaf telling us about your own favourites, and watch out for characters from the exhibition as you explore NLI! This award-winning exhibition is a must see for all Yeats fans. Free guided tour available on Wednesdays at 1pm and every Saturday at 11am and 3pm.